Yes, you are at the right place but with a new look and a new address! I’ll keep my old domain name for a while (it will redirect you here) but hope you’ll update your links to reflect the new one. Oh and RSS feeds too. 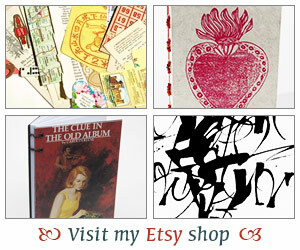 All entries from my old blog are here plus I’ve added a Book Art section. That’s for when I want to share some of my crafty projects. Better yet, I can finally keep all my comments unlike in my old blog. You don’t know how long I’ve had this in the works. Big thanks go to my husband who did most of the work. As usual, I can’t have a big event go by without some fanfare so I have three small library pocket books to give away. These mini books are made from library pockets. You can use them to keep your library books due notices or the paper scraps where you list the titles to add to your TBR list. Leave a comment and I’ll do the drawing on Thursday! I’ll be back tomorrow to post reading stats for 2006 & reading goals for 2007, and to tell you about some really good books I read over the holiday. Happy New Year everyone and here’s to a great year of reading! Oh, am I your first commenter (sp?) on your new blog? Yeah!! Please include me in your drawing. I will definitely update your link on my book blog! Happy New Year! Wow, so many people getting new looks for the new year! Love the new format (and being able to see prior posts). I like the new look! Have a wonderful new year! Like the new look! I’ve updated my blogroll. I found your blog sometime last fall and have been enjoying your reviews. wow. pretty! i like the new digs. LOVE the new look Iliana! Beautiful! Hope you and your husband had a great weekend celebrating the new year! Oh Iliana this looks fantastic! Great job to the hubby! And so glad you get to keep your comments! I know you must be excited. Wow the new layout is beautiful! I’m anticipating the bookart section too. I love paper arts and have been wanting to try making my own books. I’m hoping to take a class at the local community college in the summer. I can’t wait to see your stuff. This is great girl! A fresh new look for your blog! I have to comment more on your blog this year! Well, one of my resolutions is to read at least two books a month, I know to some of your readers that doesn’t seem like a lot, but for me it is, I’ve got so much going on in my life, well you know. Anyway, you’ll have to keep me motivated! 🙂 Hope you have a wonderful New Year! Hugs! Beautiful new site Iliana! Happy New Year! Happy New Year, Iliana! It’s a lovely look. Wow! Iliana, the new look is beautiful! Oooh, swanky new digs! I like!!! Ooooh, so fancy! It’s just beautiful in here! What a lovely way to kick off the New Year. Can’t wait to see what you’ve been reading. Girl, the new look is fantastic!! I’ve updated my link to you already so I don’t forget…seriously though…LOVE it! Love the new design! And here’s to a happy 2007 with LOTs of good books in the wings! Wow. Looks very swish. I like being able to see past posts with comments attached. Happy new year to you, iliana! Love the new “you!” And how great to have all your future comments archived. Kudos to your hubby. Look forward to reading all your 2006 stats. Happy New Year! The new site looks great!! Happy New Year and you bet I’ll update my links!! I was indeed shocked at first, sure I had the wrong spot. Like the bright, clean new look and can’t wait for your reading wrap up post! Neat-o! I wanted to update my site, too, but I got sick. Boo-hoo. Happy New Year, BookGirl! Oh, I like! Very much! New Year, new look, great idea. Add me to the list of admirers of your blog’s new look! I can’t wait to see what will develop in your bookart section – what a great idea! Nice! I love the new look. I’ll try to update my blogroll soon. I really love your new look. I love the beautiful graphics/photos added and of course the calligraphy work! Brilliant and I also like that you added a bookart section. Can’t wait to see what shows up there. What a great way to start 2007. Can’t wait to catch up soon! HUGS! What a nice surprise for 2007! Have fun blogging, reading, and creating. Oh my!!! This is truly lovely, Iliana!! I love the masthead especially. Hey! I like the new digs! And welcome back. NICE! I love the new look. I was thinking I needed to some housecleaning over at my blog. You are inspiring me! Your new look is wonderful! I hope that the page will keep several posts viewable–I don’t always get around every day and then I feel like I miss out on posts! It seems like several people have moved or updated their blogs lately! I will change my links today! Kudos to your husband for all the work! I love the new look. Even commenting is kind of fun… I can’t believe you’ve read 91 books this year. I tallied up my totals… only 68. I’ll have to try harder this year! I thought I was lost when I first clicked on your blog! Very stunning new look. Happy New Year to you, too, Bookgirl.